The Vantage Point Server allows you to change its configuration while its running, through a convenient, intuitive user interface. All of the configuration options are available under the Manage tab (this is the first tab you will see when you start the server). Every menu that allows changes in the server configuration has an Apply button, and a Cancel button. Any changes made through the configuration menus in the Manage tab must be applied before they will take effect. Contains settings which will affect the behavior of the server in general. Allows you to create and modify connections. Allows you to create and modify Device Pollers. 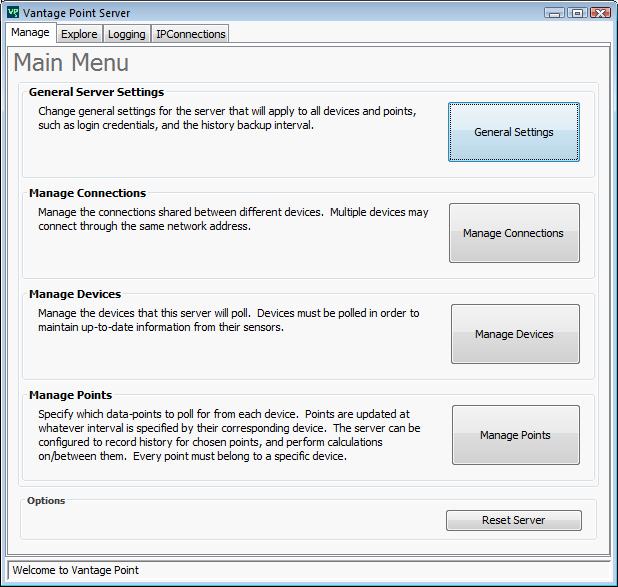 Allows you to build a list of points, which will be polled by the Vantage Point Server. Forces the Vantage Point Server to restart, and reload the configuration file. You must do this if you change the configuration file outside of the Vantage Point Server.